When you lie to me, you practice to deceive in order to mislead me. When you lie, while looking me in the eye, you become the falsification and the fabrication of self that creates a breach of trust between us. I can handle the truth. We have had this discussion. We agreed, without repercussion, “…the truth … and nothing but the truth.” Truth has been the holder of our bond, our value and communication system, our trust, our security, our word and our love. I had to find out that you lied to me. I look at you as you expound your tale, watching and listening because the lying support gets frail. If I listen, without question and interruption, but with close observation, while taking note of your animation, whether it is in your behavioral neutrality or your lying dual personality, your untruth fills me with suspicion, therefore, activating my intuition. A lie will never tell, but in its quiet spell, it reveals the facts in opposition to its position. A lie works like a cancer. It goes through the belief system uprooting every secured answer built on trust. Creating reprobation as it goes, making delusions of a lie for truth and truth for a lie. Severing all trust levels, eradicating belief and injecting doubt. Replacing reality with illusion. The question becomes what is true and what is false? This is why I do not believe you now. Your word is now questionable, not reputable, undependable and unreliable. Why did you lie and put our relationship at risk to die? When you told me you loved me, was that fact or fiction? When you smiled, looked me square in the eye, and told me it was you and me against the world— this statement is now held in question. How long has Lie, the intruder, been practicing deceit, on your behalf against me? I invested my heart, soul, and trust in you, while you were practicing to be my deceiver, my betrayer, and my breach. My emotional system has suffered a painful break, because I have been led astray and lost my way, questioning if what I feel is real. Is this the way you and I were supposed to go, or was this your plan from the get go? You tell me that everything you have said and done has been true. You say it was just this one lie. You say this as you look me in the eye. You shout, “Believe me, it is just this one time that I have breached you and me!” You are asking me to believe you, but this too can be a part of your practice to deceive. Was it a lie when you told me you loved me, each time you kissed me goodbye? When we made love, was it the lie I was riding, while you stood back in hiding? You cannot begin to conceive the levels of my disbelief. At this point, I do not know what to do. But to answer you, I will take this one day at a time, and make my decision about us, at a time when my mind is not on a downward grind. In the meantime, you must bring truth back, and make it extremely transparent, so I can clearly see and feel assured, that you have no hidden agenda. Your actions must provide the support of every spoken word. Go back to the basics of saying what you mean and meaning what you say. When you say you are going to do something, please do. Any iota of discrepancy and contradiction shapes the prediction of the future between me and you. Do not ask me to believe until you have exhausted every option, question, answer, fact, or truth. Go to the 7th circle of hell— do what you need to do. If you really love me, you must regain my trust. 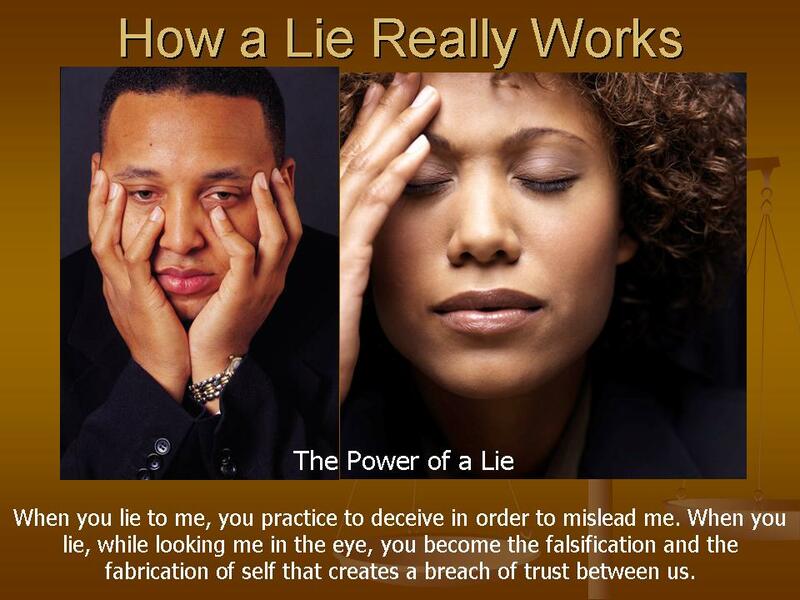 While practicing in your state of falsehood, you were remiss of the power of a lie you invited to come in, and destroy everything between you and I. And when your exhaustive chore is done in trying to rebuild us, check your soul’s core and ask why did “Lie” come knocking at your door. This entry was posted in Actions in Relationship, Emotions and tagged a liar in the relationship, a lie in the relationship, being betrayed by a lie, breach, deceit in the relationship, false, how a lie destroys a relationship, how to get over a lie in the relationship, Lie, lying in the relationship, rebuild, trust, truth, why do people lie and destroy relationships. Bookmark the permalink. Natalie, every week you succeed in taking and embarking us on a journey, that only you can drive. I am so enamored by your ability to, captivate, motivate and mold your readers into the concise true being of who you are as a writer. I appreciate the quest for truth in your exposé, regarding the lie. Yes, once the truth has had no discovery in an individual, the recovery MUST become transparent.